Embracing the Heat Although temperatures in the Napa Valley can reach 40-degrees Celsius during the summer, it's still a worthwhile time to visit the USA’s most famous wine region. With a few minor adjustments to packing and planning, we mild-mannered Vancouverites can beat---and even embrace---the Napa heat. A Work-Around Because Napa is inland, the temperatures are a little more extreme than Vancouver’s. While the sometimes intense midday heat makes you wish you were sipping an ice-cold mojito, surrounded with spritzers by the pool’s edge, the mornings and evenings provide a cool retreat. Mild Mornings Embracing morning’s milder temperatures allows you to counterbalance wine tasting and start the day by walking to a local café for breakfast, hiking to perfect picture-taking vistas or biking on Sonoma’s back roads to wineries like Ravenswood, Sebastiani and Gundlach Bundschu. Save It for the Afternoon Save the wine tasting for the afternoon when you can sip chardonnay to your heart’s content in an air conditioned tasting room. Once you hear the next winery calling your name, dash for the car and amp the air conditioning until the next vineyard’s tasting room. Although this sounds like a bit of a process, you have to love a region where rain isn’t even part of the locals’ summer vocabulary. More Than a Room If you want to see more than just a tasting room, many wineries offer tours of their production facilities and vines. Being indoors, the production portion of tours is cool, yet walking through the pinot or zinfandel vines is a little more toasty. If you can stand the oven-like conditions for an instant and want to get up close and personal with the grapes, most wineries offer umbrellas while some of the bigger players have roofed, open-air vehicles. Poolside Retreat Depending on your affinity and tolerance for wine, after a few sequential tastings, you may want a pool break. The poolside scene from 5–7pm offers fewer crowds and soothing, milder rays. And if you’ve been tasting cabernets all day, it’s nice to have a late siesta before another glass at dinner. Good Parking Spot One night I abandoned my 5-7pm poolside rule and went out for dinner at 6:45pm. I made the mistake of dining outside and later realized why I got parking right in front of the restaurant in high season. Although surrounded by calming water features, grapevines and the allure of open-air dining, I couldn’t enjoy my dinner on the patio because the heat was still intense. Case in point, I’d been at the pool the night before until 7. Lesson Learned The next night I strapped on my party shoes and went out at 8pm. Being a glutton for punishment, I risked sitting outside. The risk paid off. Dining alfresco at the right time was a perfect way to top off an excellent day in wine country. Oddly, that night I didn’t even want wine with my gastronomic indulgences. Sonoma Travel Tips Stay – The Fairmont Sonoma Mission Inn & Spa or El Dorado Hotel Eat – The Girl and the Fig and El Dorado Kitchen Do – Consider navigating to wineries near your hotel by bike. Most major hotels rent bikes to guests for $25/day. As of yesterday, guests of Fairmont properties in the USA (and Canada) can use on-site BMW bikes for free. 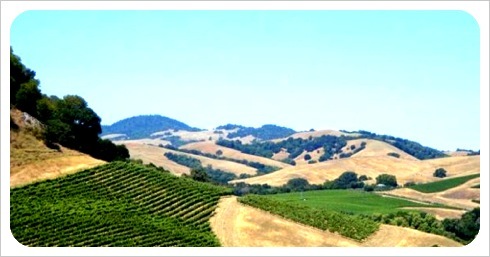 Sonoma's back roads may be off the beaten track, but the wineries are worth a visit. Trip Styler Tip: Whether biking or driving to wineries, if traveling as a pair, share tastings so you can winery-hop without indulging in too much nectar.